On this page you'll find a (limited) collection of real life sample scripts and unattended installation procedures. Obtain a free license to redistribute the software on your local network. Download the Flash Player(s) for your browser(s), the URL will be sent by e-mail. Note: Many people, including myself, had trouble downloading the most recent Flash player for Internet Explorer from Adobe's Flash download page. In that case, try the download link for the executable installer on Adobe's Troubleshoot Adobe Flash Player installation for Windows page. Before installing the new Flash Player, first remove the old one(s), before they become a security risk. To uninstall just one (recent) version, you can also use the general MSI uninstall procedure. First complete the Adobe Reader Distribution Agreement which allows you to redistribute the software on your local network. Next, download the redistributable version of Adobe Reader. The URL will be sent with the license. Then use the Adobe Customization Wizard (link will be provided with the license) to create a customized MST file. Finally, install Adobe Reader using SETUP.EXE, without any command line switches. The customizations are stored in the .MST file, and the .INI file will tell setup to use that .MST file. Download the appropriate Adobe Reader MSI. If you prefer a non-English version, browse Adobe's public FTP site for the latest version in the language of choice. Then install it like any MSI package. A detailed description of command line options is available (of course) in PDF format. Though written for version 9's setup executable, it also lists MSI properties. This command will create a file d:\exportpath\Property.idt that contains a list of properties, some of which may be used on the command line (not tested!). Download the latest FireFox 3. * version (e.g. "Firefox Setup 3.6.12.exe"). You'll also find details on silent installation of FireFox version 4. * there. Note: Rumor has it that Thinderbird installs likewise. The first part of this code reads the program directory from the registry. It can be replaced by a hardcoded path if you use a predefined installation directory. helper.exe is located in a subfolder "uninstall" of the FireFox program directory. Note: The GetUnins* scripts may also help you find some plugins that you don't want to leave on the computer when uninstalling FireFox. 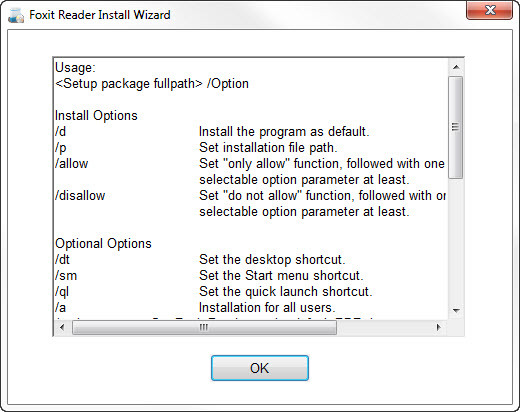 Download Foxit Reader 4.3 (FoxitReader43_enu_Setup.exe). Notes: More information on available command line switches for Foxit Reader 4.2/4.3 setup can be found here or using the command FoxitReader43_enu_Setup.exe /? The /allow and /disallow switches are mutually exclusive. Using the /allow switch seems to always install the eBay shortcuts, even when not specified. Uninstall.exe is located in the Foxit Reader program directory. If you installed the plugin, you'll also find UnInstallPDFReaderPlugin.exe there. Running UnInstallPDFReaderPlugin.exe does not uninstall the plugin, however, so to remove the plugin you need to perform a full uninstall and then reinstall Firefox Reader without the plugin. Note: This information is outdated. Read more on deployment of Foxit Reader for its current Enterprise version. Unattended or silent Java installations may seem confusing, as the documented command line switches simply don't seem to work. START /WAIT jre_package.exe /s /a /s /sms /v"%MSIArgs% %MSIComp%"
Note that some of the command line switches are case sensitive. Read the information at unattended.sourceforge.net for more details on the first couple of switches, as well as the information at java.sun.com for more details on the Java specific switches (the ones in capitals in the quoted part of the command line). Update: For some Java versions you may have to remove the /s /a /s /sms command line arguments. Just try the commands on the command line. If any of the arguments is invalid you'll get an error message telling you which one. If you had to remove /s /a /s /sms then you are dealing with a packaged .MSI and only the /qn /norestart... switches are required, without the quotes and without the /v switch. First download the appropriate language version. Move the downloaded executable to an empty directory and unpack it. Unfortunately, unless you opt for SendKeys, there is no "unattended" command to unpack. Just click Next, change the destination directory if you didn't do so already on the command line, click Unpack, Cancel, Yes, Finish. You now have a folder named d:\destinationdirectory where the unpacked files are stored. IF NOT "%RegisteredUser%"=="" SET MSIUser=USERNAME="%RegisteredUser%"
IF NOT "%Organization%"==""   SET MSIUser=%MSIUser% COMPANYNAME="%Organization%"
More information on command line arguments for the OpenOffice 2. * MSI package can be found at the Automatic Installation of OpenOffice.org page. Update: Create an unattended / silent install of OpenOffice.org 3 (should work for 4. * too). First download the latest WGA installer. Note: At the moment of writing, the file name was WindowsXP-KB905474-ENU-x86.exe. You will need to modify the name in the following code if it were to change with a future update. I haven't figured out yet how to silently install the WordPerfect Office Suite 12 itself. However, this install command for the servicepacks will at least prevent 2 reboots. First download the appropriate patches for your language version. For the English WordPerfect 12 version these were WP12SP1E.msp, WP12SP2EN.msp and WP12SP3EN.msp (no longer available). Note: This procedure is identical for other patches to other software, as long as the patches are in .MSP format. CSCRIPT //NoLogo drive:\path\GetUnins.vbs /F:"software name"
Find the uninstall string for the version you want to uninstall. You may also want to enable logging the uninstall by using the /L switch. Read more on my MSIEXEC page. Pay special attention to (unattended) installation of software from this list: a full install may include some unwanted "piggybacked" software!